The GROHE Costa L sink mixer – versatile style and superior craftsmanship! A perfect fusion of German engineering and beautiful yet timeless design! The wall-mounted GROHE Costa L sink mixer makes a serious style statement in any contemporary bathroom. Packed with GROHE technology, the impressive tap is made from the finest materials to ensure it lasts a lifetime and is a pleasure to operate. The tall swivel spout with mousseur is super convenient and can be turned with the lightest touch and the gleaming GROHE StarLight chrome coating is scratch-resistant and very easy to clean – a quick wipe and it looks shiny and new. 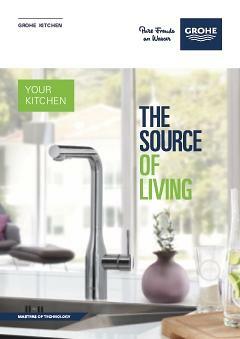 GROHE Costa – a quick kitchen upgrade that balances style with everyday performance you can trust! Striking the perfect balance: medium high spout for easy handling and filling of high pots. A tap with this spout is especially suited to kitchens with a small sink.